I subscribe to Aeon digital magazine – an online magazine of ideas, philosophy and culture. A recent video bearing the title ‘An ageing philosopher returns to the essential question: ‘What is the point of it all?’ caught my attention. The ageing philosopher in question is Herbert Fingarette, who died at the end of last year, at the age of 97. 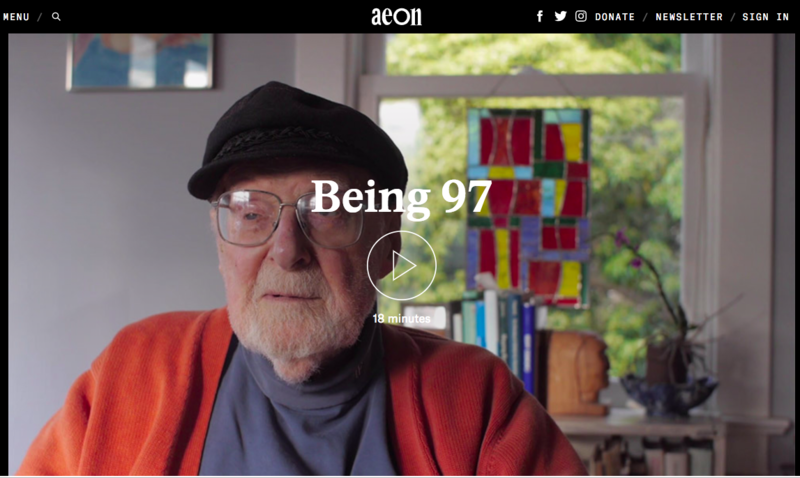 In this film, recorded in the last months of his life, Herbert Fingarette reflects on his life and what it means to be 97, to outlive a deeply loved wife by seven years, to know that what you can now do (after a long and successful career as a professor of philosophy and author) is increasingly limited, and to accept that death is near. For me this is a moving film, sad and concerning, but also uplifting. It was sad to see how very much he still missed his wife, being moved to tears on listening to music that they had both enjoyed together. I was struck by his description of her as ‘absent present’. ‘Her absence has been a presence’. It was also sad to hear him talk about being afraid of death. In 1999 he published a book, Death. Philosophical Soundings, in which he wrote that it is not rational to be afraid of death and that there is no good reason to fear death. But now he doesn’t believe this. He is now (at the time of filming) afraid of death and doesn’t know why. For me it was concerning to see what I perceived to be the utilitarian nature of care in old age, and I realised that I hope that when my turn comes I will be cared for by someone who loves me, rather than by someone for whom care is a job, however good they are at that job. But it was uplifting to see a 97 year old still interested in life, reading with the support of his computer, listening to music, drawing in pencil and pastels, and still moving about his house unaided and surrounded by his own possessions. And most importantly, still learning. All his life until now, at the age of 97, he has not appreciated the beauty of the trees in his back garden. Now he says, ‘Seeing the trees is a transcendent experience’. At the age of 97 this is a new experience, which connects him to life. It’s not surprising that so near the end of his life he is still asking ‘What is the point of it all?’ This is the preoccupation of many philosophers. His conclusion was that there is no point. It’s a foolish question. But by his own acknowledgement he had a happy life and more importantly he had experienced what it means to love and be loved. Perhaps that is the point. 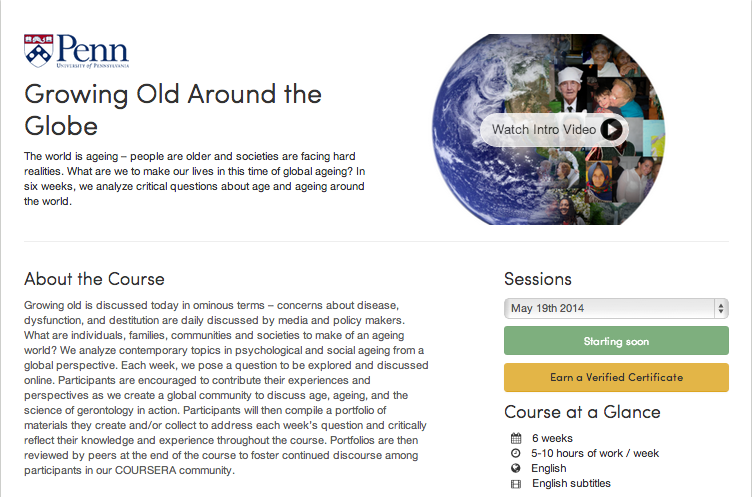 This 6 week Coursera MOOC – Growing Old Around the Globe – starts tomorrow – Monday 19th May. The MOOC is convened by Sarah Kagan and Anne Shoemaker from the University of Pennsylvania. They have already said that there will be some changes in the MOOC this second time through – and straight away I notice that it’s now possible to sign up and pay for a verified certificate. Whether or not you want a verified certificate, the assessment tasks are interesting and encourage a personal and creative approach – they are flexible enough for anyone to give them a go. I think Sarah and Anne have also changed their introductory video. I particularly like their focus on compassion and respect. I remember from the last run of this MOOC that there are many moving stories about people’s experiences with ageing, either their own or their relatives and friends, and many interesting stories about how different cultures deal with this. And this MOOC is not only for those in declining years. Last time the MOOC attracted some teenagers, as well as people in their 80s and the whole range of ages between. People of all ages can be touched by the issues associated with ageing. For anyone whose life is being or has been affected by these issues, I can strongly recommend this MOOC. I am finding OldGlobeMOOC a fascinating experience – quite unlike any other MOOC I have participated in, and my first xMOOC. For me one of the best things about OldGlobe is the diversity of the participant group. All the other MOOCs I have participated in have attracted groups in which similarities can easily be seen, i.e. mostly from academic backgrounds or interested in e-learning technologies. But OldGlobeMOOC is truly diverse. It has attracted a huge age range from 11 to upper 80s, and people from all continents apart from Antarctica, although as you would expect the American participant presence is, I think, dominant – it would be interesting to see the analytics. But more importantly, it has attracted people from all walks of life and from very different education backgrounds. We have people very knowledgeable about the discipline of gerontology and related health and medical issues, but also very many people who have no subject related background other than we are all ageing and therefore all have a point of view. This diversity is great. The stories being told in OldGlobe are richly diverse and a privilege to read. But this diversity brings its own problems in relation to peer assessment of the OldGlobe assignments. But the peer review process is where the wonderful diversity in OldGlobeMOOC creates problems. We have the whole continuum of people from those who have no experience of peer review to people who have worked in Higher Education for years and are very experienced in assessing student assignments and reviewing research articles. This is a dilemma for OldGlobe, because some participants are getting a bit of a rough deal in terms of their feedback, despite the OldGlobe team urging participants to be generous with their feedback and scoring. For example, one participant has been accused of plagiarism for his/her original submission, another has been accused of plagiarism for using an essay site, even though this was cited as a source, another has received the feedback ‘I don’t get it’ and a mark of zero for an academic piece of work, others have received one line or less in their feedback. It all seems a bit of a lottery. So diversity brings both advantages and disadvantages. How might this dilemma be overcome? I applaud the OldGlobe team for designing the MOOC to attract such a diversity of participants and for designing the assignment tasks such as they can be completed by anyone from any background. We are all getting older. We all live in a society where we can see people getting older. We all know old people. We all have some thoughts and perspectives about the ageing society. Even an 11 year old can say something about their grandparents and an 89 year old has a wealth of experience to share. We can all read other people’s discussion forum posts and assignments and have a response. I think the whole age range could do this, provided they could understand the submission. It seems straightforward, but given the diversity of course participants is so open to misinterpretation or overly subjective interpretation, which some participants seem to have experienced. For me, the peer review process on the first assignment has been positive. I have really enjoyed reading the submissions I was sent to review. They were not all academic pieces of work, but they had all been thought about and I appreciated the open sharing of experience however articulate or inarticulate that might be. This MOOC is not for credit. Participants will simply get at Statement of Achievement. This makes me wonder if we need points at all. I think the feedback is very valuable and I would prefer to call it feedback than peer review, which I think puts the emphasis in a different place. But perhaps we don’t need the points. Perhaps it’s enough for participants to complete the assignments and 5 peer reviews to receive the Statement of Accomplishment. Of course, using this system, some people will receive the Statement of Accomplishment for exceptional work and some for simply submitting ‘any old thing’. But does that really matter, given that this course is not for Higher Education credit? If it came to a choice between diversity and peer review – I would go for diversity, and trust that people are participating in the learning environment just as much as they want to and need to for their own purposes. There is so much of interest in OldGlobeMOOC. As an educator myself I find this tension beween diversity and peer assessment very interesting, quite apart from the fascinating discussions about ageing. This 6 week Coursera MOOC starts next week June 10th – see https://www.coursera.org/course/oldglobe The syllabus looks fascinating exploring many aspects of ageing, from biological to social. The MOOC format will be similar to the one taken by Prof Al Filreis for his Modern and Contemporary American Poetry MOOC (ModPo), which although I did not take, I have heard such positive feedback about from quite a few sources, including this guest post by Ian Chowcat on Seb Schmoller’s Fortnightly Mailing. If my understanding is correct, a key to the ModPo MOOC’s success was the building of a sense of place and community, through weekly live discussions. This weekend there was a great blog post about the positive effect that the ModPo MOOC has had on a 17 year old boy with severe autism. Growing Old Around the Globe will follow a similar format to the ModPo MOOC and it will be interesting to see what stories are generated as a result of the MOOC. More than 4000 have signed up for the MOOC. It promises to be an engaging 6 weeks. I came across this appalling phenomenon for the first time yesterday. I was discussing the care of the elderly with a friend who told me that ‘granny dumping’ is becoming increasingly common in India. My friend is Indian. On returning home I searched for this on the internet and am even more shocked to find that this is a world-wide phenomenon that has been happening for years. Elderly people are abandoned by their relatives who then make themselves uncontactable; they are left outside a hospital, bus station, or in any public place unknown to them. In India they are taken to festivals at a distance from their villages and left there. It is because of situations like this, because my own mother has dementia, because I am ageing myself (aren’t we all!) and because the number of people over 65 in the population is increasing dramatically (see Older America for US figures), that I have signed up for Sarah Kagan and Anne Shoemaker’s Growing Old Around the Globe MOOC. The world is ageing – people are older and societies are facing hard realities. What are we to make our lives in this time of global ageing? Growing old is discussed today in ominous terms – concerns about disease, dysfunction, and destitution are daily discussed by media and policy makers. What are individuals, families, communities and societies to make of an ageing world? We analyze contemporary topics in psychological and social ageing from a global perspective. Each week, we pose a question to be explored and discussed online. Participants are encouraged to contribute their experiences and perspectives as we create a global community to discuss age, ageing, and the science of gerontology in action. Thank you to Sarah and Anne for inviting me to be a Teaching Assistant on this course. I am very much looking forward to it. The Twitter stream for this course is @OldGlobeMOOC where Sarah is already posting some resources and I have posted the link to the Facebook site above.